Eleven new release gins from celebrated distilleries are to be revealed by That Boutique-y Gin Company, following its recent launch. That Boutique-y Gin Company claims to be the first independent gin bottler. Working with brands ranging from famous and well-established distillers to talented up-and-comers, That Boutique-y Gin Company is releasing limited-edition, individually numbered batches of gin. That may take the form of tweaks to a distillery’s regular recipe, secret unreleased ‘pet projects’, off-the-wall experiments, or new concepts developed from scratch with That Boutique-y Gin Company. That Boutique-y Gin Company follows in the footsteps of its hugely successful sister company, That Boutique-y Whisky Company, which has won dozens of awards, including at the World Whiskies Awards, since launching in 2012. It was recently named Islands Independent Bottler of the Year at Whisky Magazine’s Independent Bottler’s Challenge 2016. Aside from bottling truly outstanding spirits, it also created the World’s Best Blended Whisky (World Whiskies Awards 2015) and have won awards for their unique graphic-novel-style labels. 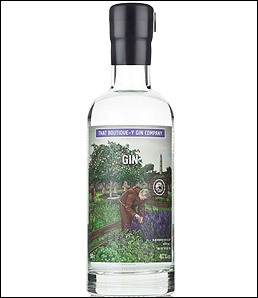 That Boutique-y Gin Company’s bottles will feature similar hand-illustrated labels, this time created by Grace J Ward. The designs will feature nods to the particular gin or distillery in question, gin industry (gindustry) ‘in jokes’ and well-known faces such as That Boutique-y Gin Company’s own David T Smith. Like its sister company it will also occasionally release its own creations, starting with Cherry Gin - which it claims is the first of its kind commercially available. The releases are available from Amazon and Master of Malt. Ableforth’s Bathtub Gin - Batch No. 2 - Pedro Ximénez cask-aged. Blackwater - Batch No. 1 - with quince, rosehip and bletted medlars. Cherry Gin - Batch No. 1 - with sweet, and sour Marasca cherries. Cotswolds - Batch No. 1 - double-barrel blend of first fill ex-bourbon and red wine cask-aged gins. East London Liquor Company - Batch No. 1 - with Douglas fir, lime, orange and exotic miyagawa. FEW - Batch No. 1 - with lime, coriander seed and fennel. Greensand Ridge - Batch No. 1 - with distilled raspberry juice and cobnuts. Hernö - Batch No. 1 - with fresh rose petals, blended with Juniper wood cask-aged spirit. McQueen - Batch No. 1 - Chocolate Orange Gin. Shortcross - Batch No. 1 - with distilled blackberries and damsons from the distiller’s estate.